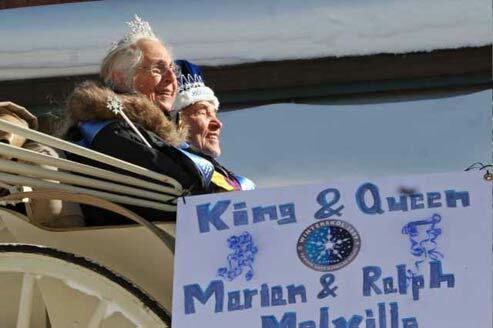 Ladies & Gentleman, the 2009 Wintersköl committee is pleased to announce Ralph & Marian Melville as this year’s King & Queen! Ralph Melville initially arrived in Aspen the year of the very first Wintersköl celebration, 1951. But that first arrival was just for a winter, and later he would return to stay. Originally from the Boston area, Ralph went to school at Dartmouth College in New Hampshire and majored in Physics. After graduating, Ralph got a job at a friend’s father’s ski lodge in the Appalachian Mountains. Ralph decided that he liked working in the lodging business much better than physics and decided to make that his profession instead. In 1950, his friend had been to Aspen for the FIS ski races. Impressed with the area, he encouraged Ralph to visit here before deciding where to open a lodge of his own. In 1951, Ralph came here to be a ski bum for the winter and did indeed observe the town but decided that it had been over-built and so he left. However, Ralph decided to return again in 1953 and purchased the property where the Melville’s Mountain Chalet, Aspen now stands. At that time, the property housed an old house and a log cabin. Ralph tore down the house, lived in the log cabin and in 1954 began to build the original Mt. Chalet. The lodge opened for Christmas in 1954 with 3 of 9 rooms ready to go. Ralph lived in one of the rooms, operated the lodge and in 1956 began to expand. Between 1956 and 1969 several stages of expansion occurred (including obtaining the old miner’s Billy Zaugg’s property next door) and the majority of the lodge was complete. In 2003 an additional expansion took place including adding 8 more rooms and the 5th floor conference space with fabulous views. Today the Mountain Chalet, Aspen hosts 55 rooms and four 2 bedroom apartments. Much of the lodge was built by Ralph himself and was originally built in the 1950’s by the hands of just 2 people. Before coming to Aspen, Ralph had built homes back east and in addition to building the Mt. Chalet, Ralph also built several homes in the Aspen area. In the mid-50’s another youngster was bitten by the ski bum bug and decided to move to Aspen for the winter. Originally from Philadelphia, Marian graduated in 1951 from Bucknell with a degree in Math. After taking a ski trip with the Pittsburg Ski Club to Mount Tremblant, a friend convinced her to come to Aspen. In 1955 Marian arrived, lived in the Prince Albert, and worked for Jack DePagter (the creator of Wintersköl) at the Holland House, the Golden Horn and the Sundeck. And as Marian says, “She never missed a day of skiing”! After the ski season was over, just like many other Aspen locals, her friends convinced her to stay to enjoy the glorious Aspen summers…a decision that would end up being one of the best of her life…she met Ralph. It was the whirlwind romance of 1956…Ralph & Marian met in June, were engaged in July, and married in August! But the immediate days leading up to the wedding were less than a fairy tale. 13 days before they were to be married, Ralph was in a serious climbing accident on Maroon Bells. He slipped on some ice and fell 350’, twice. Hospitalized for days in a full length arm cast, full length leg cast, and with multiple stitches, Ralph barely made it to Pittsburg for the wedding. But love conquered all and Ralph flew down just in time to make it for the 3 day waiting period required at that time for marriages. Following the wedding they returned to Aspen and the Mt. Chalet. Marian moved in and began working there as well. Over the years they were blessed with 6 children, Julie, Frank, Nancy, Susan, Karen, and Craig as well as raised 2 foster children, Riley and Kai. Most of the children still live nearby in Colorado and the Melville’s enjoy seeing them and their 16 grandchildren regularly. The Melville’s lived in the lodge for 25 years but in 1979 decided they needed a bit more privacy for just the family and so they moved out. Today Ralph and Marian live in the Cemetery Lane neighborhood. In addition to running a successful lodge for 54 years and raising a busy family, the Melville’s have also managed to dedicate themselves to the Aspen community. For years Ralph was a race timer on Aspen Mountain, in 1964 he was on City Council, he was a member of the School Board for 9 years, a charter member of the Rotary Club, and following his own rescue – a member of Mountain Rescue. Marian was a timer at the Woody Creek sports car races, a case worker at the center for conflict resolution, Chairman of the Easter Seals society in Colorado, a waitress at the annual “Hospital Benefit Dinner,” a volunteer at the hospital for 30 years, an active church staff member for 30 years, and has lead a bible study at the Jail for 20 years. The Melville’s have also generously donated rooms and conference space to many organizations and events over the years contributing greatly to their success. Ralph and Marian, thank you for being such “STARS” in the Aspen Community and for contributing so much to the Aspen Experience. The 2009 Wintersköl Committee is truly honored to have you be a part of this year’s Celebration. Congratulations, we crown you Wintersköl King & Queen!